Help us create awareness of PAM! The Jordan Smelski Foundation is committed to creating global awareness of the risks from the amoeba Naegleria fowleri. Our Don’t Gamble With PAM campaign is about getting people to learn about PAM and the risks of swimming in fresh water. 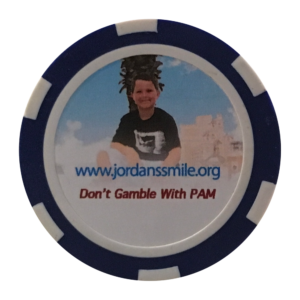 Help us spread the word about PAM by sharing the chip you found for someone else to find. Share your photo or video with our hashtag to appear on this page for others to find. Share the location of a chip! Describe location of the chip or nearby landmark. Help us spread the word about PAM awarenes!